Goya Chanpuru is popular Okinawa food with Goya, a bitter gourd.This is Goya. Also called Nigauri. It has strong bitter taste, but also very healthy. Remove extra water from Tofu. Use kitchen paper and rap it like this. Next Goya. Cut the top and cut it half. Remove its seeds with a spoon. Use only half of this skin. Cut the top and slice it into 4mm wide. Put Goya into salt water for 10 min. Cut pork into one bit side and add salt & papper. Remove Goya from the water and cut extra water out. Cut Tofu into one bit size. Let's cook. First heat a pan and add sesame oil. When pork is cooked well, add Goya and mix them well. Pour Oyster sauce around the ingredients. Add Tofu and mix them softly. Use strong heat and let water go. Remove the ingredients to a dish for now. Mix two eggs. Remove this white pieces. 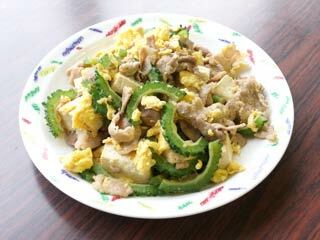 Add Sesame oil on a pan, and make half a cooked scramble egg. Add the ingredients back into a pan and cook them together. Check out and adjust the taste.